Crown Prince Frederik and secretary general of the Danish Red Cross, Jørgen Poulsen. Today, Crown Prince Frederik attended a staff meeting at the Danish Red Cross. The focus of the meeting was last week's earthquake in Indonesia and the work the agency is doing in the disaster area. The Crown Prince was briefed on the emergency assistance the agency is providing in his role of affiliation to the Danish Red Cross. Last night Crown Prince Frederik took part in the opening of the 8th Global Conference on Ageing 2006 convened by the International Federation on Ageing at the Bella Centre in Copenhagen. He was received by CEO Bjarne Hastrup, DaneAge (Ældresagen) , President Yitzhak Brick, International Federation on Ageing and Per Thestrup, Chief of Board DaneAge(Ældresagen). IFA's 8th Global Conference (30 May - 2 June 2006) will highlight cross-cultural co-operation to meet the challenges of global ageing. The main Conference themes are: The Economics of Ageing; The Challenges of Ageing; Active Ageing - Ageing Well and Empowerment and Participation. Today Crown Prince Frederik presented scholarships for The Crown Prince Frederik Fund at Amalienborg (Christian VIII's Palace) in Copenhagen. The purpose of the foundation is to provide financial assistance to students of social policy and sciences, for one year’s study at the John F. Kennedy School of Government at Harvard. His Royal Highness Prince Joachim of Denmark is visiting San Francisco, Silicon Valley and Los Angeles from May 31st - June 5th, 2006. Prince Joachim starts his visit on the west coast in the San Francisco area where he opens the Innovation Center Denmark in Silicon Valley. During Prince Joachim’s visit to Silicon Valley, a number of Danish high-tech companies in the area will be highlighted. Prince Joachim will also attend a lunch celebrating the 30th anniversary of the Danish American Chamber of Commerce in Northern California. Prince Joachim is also visiting the Mondavi Vineyards in the Napa Valley during his stay in the Bay Area. Prince Joachim continues his journey on the west coast to Los Angeles. In his capacity as Festival Patron, Prince Joachim is opening the first Danish film festival in Los Angeles - "Danish Film. Dogme95 Style" (http://www.dkfilmfestla.com/). Prince Joachim is also the guest of honor at the centennial celebrations of the Danish church in Yorba Linda. During his time in Los Angeles Prince Joachim is also meeting with local representatives of Danish businesses in the area. The Danish Ambassador to the US, Friis Arne Petersen, will be accompanying Prince Joachim for the duration of the visit. 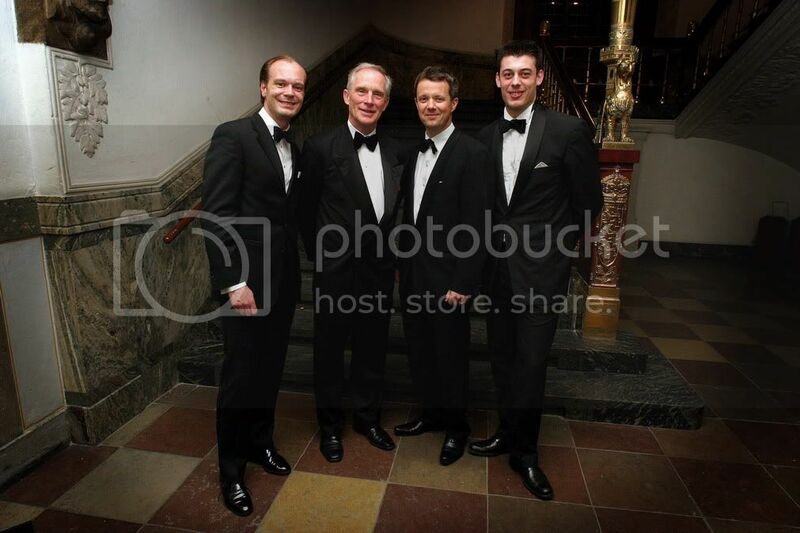 On Monday May 22 Crown Prince Frederik attended a private talk given by ex-Secretary of State Colin Powell. As far as we can discover there are no photographs taken at this event so we present screencaps from the DR1 (Danish TV) report which appeared on the news. Crown Prince Frederik has an MA in political science from Århus University and wrote his final paper on the foreign policy of the Baltic States. Frederik lectures on international relations at the defence force academy, however there are no public statements as to how extensive his lecturing and collegial commitments continue to be. 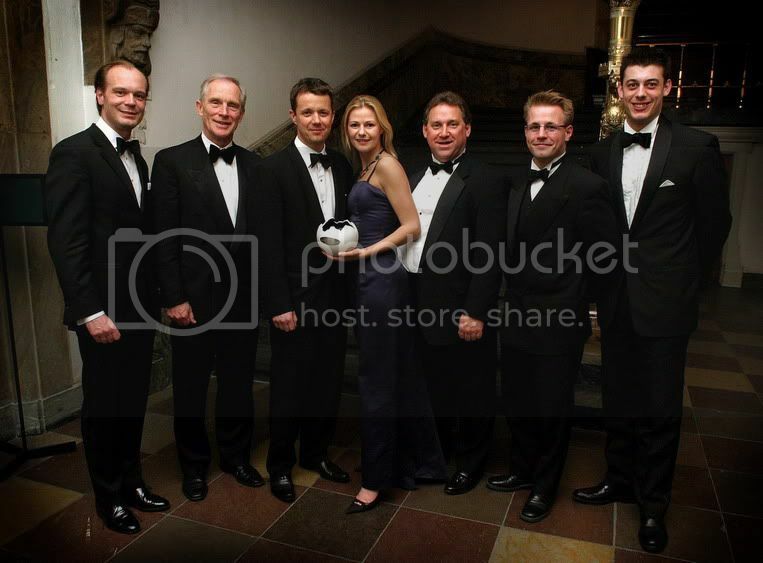 A while ago now, but Crown Prince Frederik did the honours and awarded students at the Graduate Business Conference at Copenhagen City Hall on 7 April 2006. Some photos from the last day of the state visit to Greece. Queen Margrethe was able to enjoy one of her favourite things: antiquities. The Queen is a bit of an amateur archeologist, so seeing Greek antiquities was right up her alley. Queen Margrethe II of Denmark, looks at antiquities in Thessaloniki's Byzantine Museum in northern Greece on Friday, May 26, 2006, with museum director Anastasia Tourta. Queen Margrethe II looks at the golden wreath and casket, or larnax, which contained the remains of King Philip II of Macedonia, during a visit to the museum at ancient Vergina, in northern Greece. The Governor of New South Wales, Professor Marie Bashir, has just returned from a private visit to Copenhagen and she unexpectedly caught up with Crown Princess Mary while she was there. The Sydney Morning Herald reported in a little snippet on May 28 that Professor Bashir called the palace and was put straight through to Mary, who promptly invited the Governor to lunch. Professor Bashir was the host and also a guest of several events and organisations last year when Mary was in Sydney. Finally for this roundup, we don't usually like to dignify too much of the tabloid view of the world, but as there's been quite a few tabloid inches and TV pickup of the Mary/Imelda story in Australia via Denmark, we thought we should address it. We are interested in presenting Danish royal news in a straightforward way with the tabloid fantasies sorted out for the record. Most of the time newspapers and magazines, including tabloids, give us the news we use here on this blog. We don't have any 'inside' information but we do like to cut through some of the tabloid concoctions and find the facts. PRINCESS Mary has reportedly been dubbed a "Nordic Imelda Marcos" by Danish press for her spending habits. News Ltd newspapers report the Australian-born princess earned the tag after an audit of 2005 royal finances revealed Mary and Crown Prince Frederick (sic) spent $2500 a day on clothes, shoes and furniture. According to the report the royal couple spent $933,000 on private expenses last year. Their private spending was cited in the audit as being the key reason why they spent $167,000 over their $3.4 million annual budget. One unnamed commentator is quoted as saying when Mary flashes her credit card "it starts glowing pretty quickly". The couple's entertaining band party bill came to $212,000 while magazines and books set them back a further $16,000, the report said. In general there are three different issues in the current stories about the Danish royal family: 1) Mary's spending, 2) the annual report of the Danish court, and 3) the resignation of the chef Takashi Kondo who has worked for Queen Margrethe and Prince Henrik for 25 years. First, the claim Mary is the 'Nordic Imelda' comes out of a story by Ekstra Bladet 'Mary og Frede solder for 4 mio. om året'. This newspaper is a sensationalist newspaper currently carrying on a bit of a campaign against the royal family. The last attack was on Princess Alexandra and her appanage and spending and this week it was targeting Mary (and her shoes as a symbol of her excessive spending). This financial information supposedly comes from the recently released 2005 Annual Report and the tabloid Ekstra Bladet has worked up these stories over the past month by fabricating their own version. We don't know how many shoes Mary has (it is not in the annual report) but we can say, yes, she does have some nice shoes which she wears to do her 'job' as crown princess. These sort of campaigns by tabloids is to sell papers and is not really about truthful reporting. To the 2005 Annual Report of the Danish Royal Court, we already reported on this a month ago in Danish royal roundup # 3. The report is the financial statement of the royal court and the whole household. It is not a statement of the personal finances of members of the royal family. Nowhere in the report itself is there any detail about any spending by Mary in particular or any other member of the royal family. All the expenses mentioned are those of the household, ie: payment of staff, expenses for state events and running costs of court offices, etc. Ekstra Bladet has literally made up the figures and some sections of the tabloid media in Australia have followed. Now to chef Takashi Kondo and his resignation and obvious disappointment at the changes introduced in the running of the royal household. The court has a new agreement in place about working hours in which the staff have a more fixed work schedule. This has been a challenge to the goodwill of staff, perhaps because they have previously worked more flexibly to accommodate the odd hours of court life. Chef Kondo has expressed his displeasure with the changes and it is very easy to understand his disappointment after serving the Queen and Prince Henrik and their guests for 25 years. No doubt, like all organisations, the Danish court must make economies to meet their budgets. Perhaps staff formerly considered it a kind of honour to work for the royal family and didn't quibble over extra time spent at work for not very good salaries. For some longstanding staff the adjustment to new working conditions (fixed hours and reasonable rates of pay) might be more difficult than for new younger workers who expect such workplace conditions as a matter of course. Okay, to get the annual report straight. The Danish court has balanced its accounts for 2005, following a deficit in 2004, largely a consequence of the crown princely wedding, which had been budgeted for. Queen Margrethe, Prince Henrik, Prince Joachim and Princess Benedikte all underspent. Princess Alexandra's budget was balanced. The Crown Prince household overspent their budget by 5% which has been paid for Crown Prince Frederik from his own funds. The Crown Prince Couple have been expanding their staff with increased duties and the birth of Prince Christian. For the record Crown Princess Mary receives the second lowest salary/appanage in the royal family with only Princess Benedikte receiving less. And, for emphasis, there is no detail in the Annual Report about any of the expenses being directly attributable to Mary. We are not so much defending the royal family, because of course theirs is a good life compared to the vast majority of the people on this planet. But we do like truthful reporting and reject the kind of tabloid fiction some Danish and Australian media have engaged in during the last week. Today Crown Princess Mary visited a Christmas Seal Home at Kildemose in Ølsted. Mary is the patron of the Christmas Seal Foundation. The Christmas Seal Foundation was founded in 1904 and each year seals (stamps) are sold at Christmas to raise money to help children. The foundation owns four Christmas Seal Homes, where children aged 6-14 stay for 10 weeks and each year the foundation helps 700 children to become oriented to a better and happier life. Today, Crown Prince Frederik presented the prizes for the 2006 ISAF Women's Matchrace World Championship in Skovshoved Harbour. He joined Mike Golding onboard the ECOVER Open 60 to experience the boat and watch the finals. Congratulations Denmark on the win! Thursday, May 25 - Crown Princess Mary out and about shopping in Knightsbridge, London. She was accompanied by lady-in-waiting (and friend), Caroline Heering. 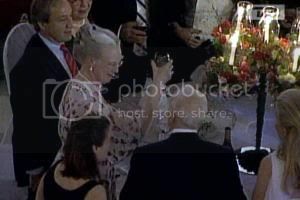 Queen Margrethe and Prince Consort Henrik attend the gala in the Presidential Palace in Athens which marked the State Visit. Queen Margrethe and Prince Henrik have ended their fairly low-key State visit to Greece. Instead of continuing a planned private tour in Greece the Queen will cut this short to return to Denmark to have knee replacement surgery at Århus Hospital. Prince Henrik will sail back home with the royal yacht Dannebrog and will visit Corsica on the way. Henrik, Frederik and Joachim will help the Queen as much as possible after her operation, which is scheduled for early next week. Århus Hospital is near the royal residence Marselisborg Palace. A toast at the gala in the Presidential Palace. The Queen's speech focused on cultural ties between Denmark and Greece. Queen Margrethe confirmed the knee operation during a press conference yesterday on the royal yacht Dannebrog. This came at the end of the State visit to Greece, a landmark since the thawing of relations between the Danish royals and the Greek government. The specific issue for the Queen had been she did not want to make an official visit to Greece, despite the urgings of various Danish governments over the years, so long as Constantine and her sister Anne-Marie were not allowed to return. 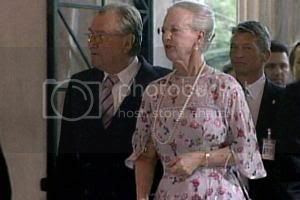 However, since Constantine and Anne-Marie have been permitted to travel freely to Greece as private citizens, the impediment for Queen Margrethe to visit no longer existed. According to Queen Margrethe her sister is 'ten years younger' as a result of being able to return to Greece. Berlinske Tidende reports the Queen's speech, given at the gala at the Presidential Palace, focused on cultural ties between Greece and Denmark. Queen Margrethe made no direct reference to Constantine or Anne-Marie in the Palace which was their former home. Berlinske Tidende also reports that at the press conference on board the Dannebrog, Queen Margrethe said how pleased she is her sister and brother-in-law are now allowed to travel to Greece as private citizens. 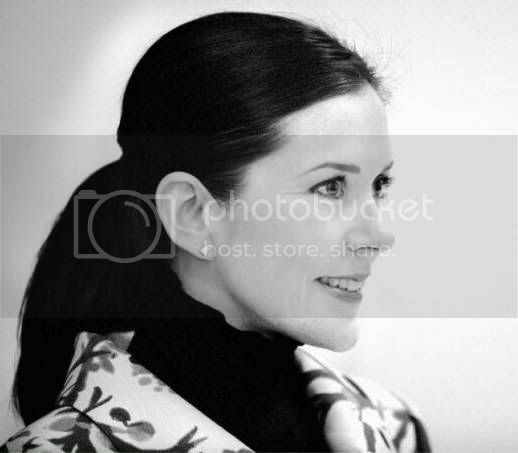 Queen of Denmark Margarethe II attends the opening of the Danish Cinema for Children festival at the 'Athinais' culture center in Athens 25 May 2006. Denmark's Queen Margrethe II looks at a statue at the Danish Institute in Athens 25 May 2006. Denmark's Queen Margrethe II stands next to an object at "Use it!" exhibition held in Athens' Megaron Plus hall on Thursday, May 25, 2006. Queen of Denmark Margrethe II is escorted by Greek Prime Minister Costas Karamanlis while leaving the prime minister's office in Athens 25 May 2006. Queen Margrethe II and Prince Consort Henrik of Denmark give a press conference on the Danish Royal yacht Dannebrog 25 May 2006, in Athens. Queen Margrethe II and Prince Consort Henrik of Denmark look at the Saronic Gulf from the bridge of the Danish Royal yacht Dannebrog 25 May 2006, in Athens. Denmark's Queen Margrethe II will undergo a knee transplant operation to help her ease the pain of arthritis. Denmark's reigning monarch, Queen Margrethe II, is to undergo knee replacement surgery early next month, she announced at a press conference in Athens on Thursday. The Queen, making her first visit to Greece in over four decades, suffers from arthritis, and will become one of the 5000 Danes annually to receive a prosthetic knee. Despite being forced to curtail her typically hectic summer schedule, Queen Margrethe is predicted to make a full recovery.